For a house with low temperature radiators or under-floor heating, our high performance Aquarea heat pump is a good solution. This solution can work as a stand-alone unit or can be combined with an existing gas- or oil-fired heating system depending on requirements. This new solution is ideal for low consumption homes. 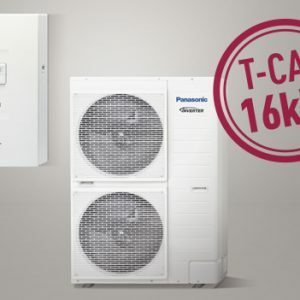 Panasonic has designed the new 5kW Aquarea Mono-Bloc heat pump for small houses which have high performance requirements. Whatever the weather, the 5kW heat pump will always give you maximum efficiency, even at -20°C! The New Aquarea heat pump is easy to install on new or existing installations, in all types of properties. How do you get heating and hot water from air? An Aquarea Air Source Heat Pump captures fresh air and passes it over refrigerant-filled coils (think fridge!). The captured heat is automatically transferred to water, which is then ready for use in your heating system and for supplying all of your domestic hot water needs. 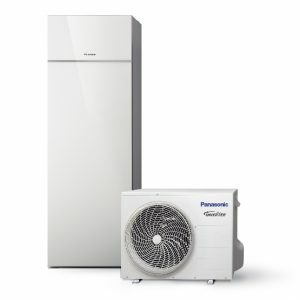 Panasonic’s latest technology offers you a sustainable alternative to oil, LPG and electric heating systems.